I originally wrote a version of this recipe over a year ago. It was the veganizing of a recipe that I’d already made vegetarian years before. It was one of my favorite go to recipes when I learned how to cook. There is something very comforting about all that yumminess atop a wonderful cornbread crust. I finally got to try it out last night, and here it is with some final tweeks! I use TVP, but you can use vegan crumbles instead to save a step, if you want to. PS– I made this with a different [savory] cornbread recipe that I was trying out. That new cornbread turned out to be a fail, but the topping is delicious on it’s own or over some brown rice too, if you don’t feel like fussing with the cornbread part. Still broil the cheese on. 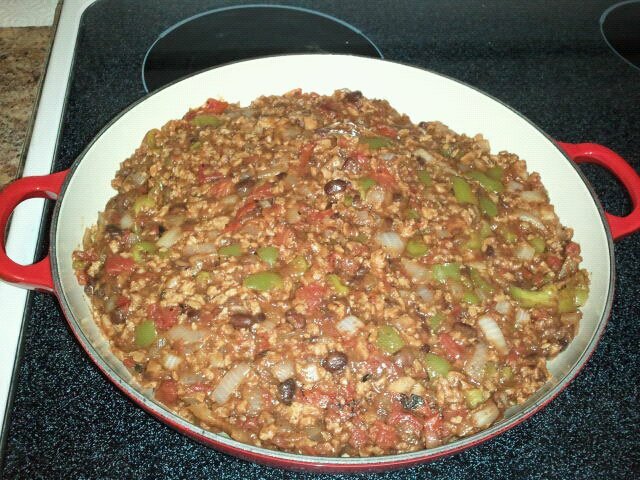 Then you can use it as a tex-mex picadillo or with some lettuce, tomatoes, rice, etc. as a burrito or taco filling! 1. Prepare cornbread according to recipe directions and pour into the bottom of a greased large oven-proof skillet. (they say you can wrap a skillet handle really well with aluminum foil and cross your fingers, but i’ve never tried it.) Bake according to instructions, or until top is lightly browned, and toothpick inserted into center comes out clean. Set aside. 2. To reconstitute the TVP: In medium sauce pan, heat water, liquid smoke, worcestershire, bragg’s until it comes to a boil. Remove from heat, stir in TVP, and set aside. 3. Heat oil in second skillet to medium. Add onions and salt, cook for 5 minutes, or until translucent. Stir in bell pepper and cook an additional 2 minutes. Add TVP and spices and cook 3-4 minutes. 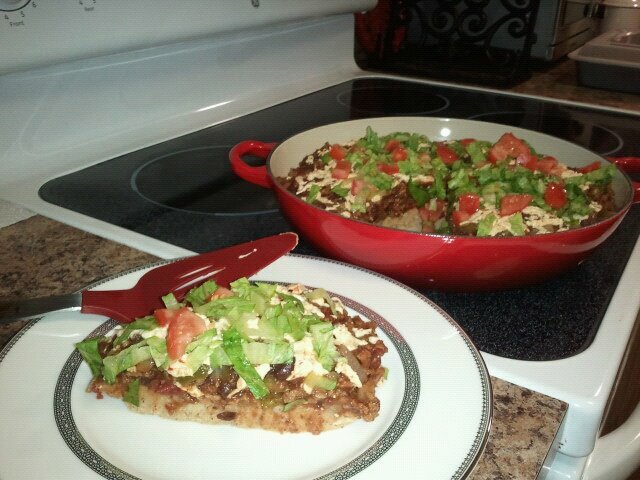 Add refried beans and tomatoes, mix in until heated through. 4. 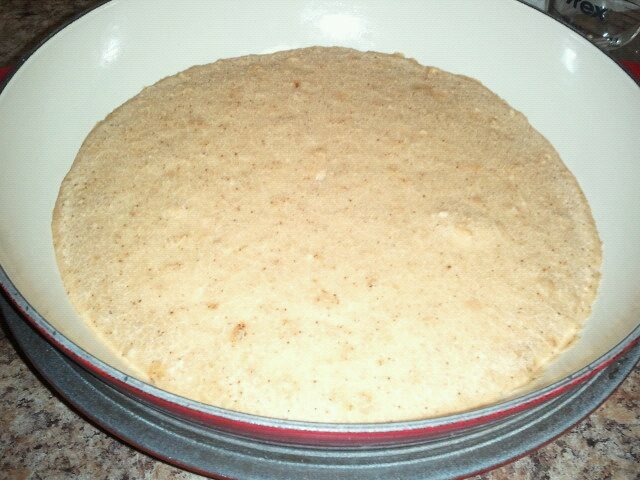 Top cornbread with TVP mixture. Sprinkle with nutritional yeast and cheese. 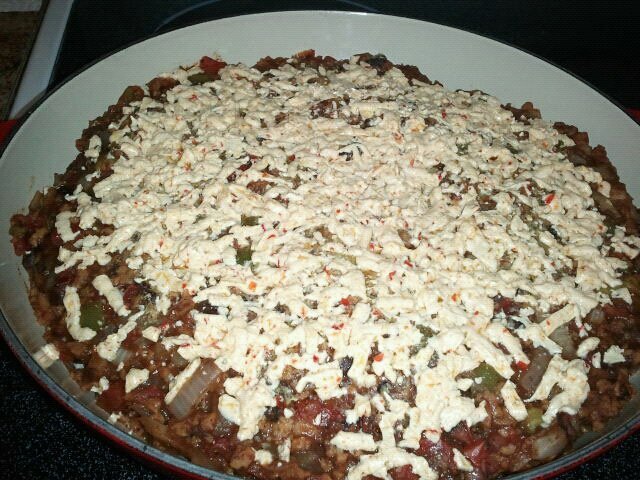 Place skillet under broiler to melt cheese, about 3-5 minutes. 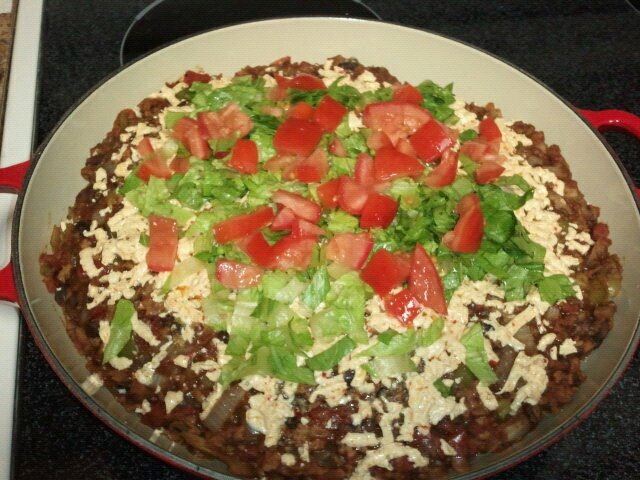 Garnish with lettuce, fresh tomatoes, olives, sour cream, salsa, and/or cilantro, as desired. This sounds UGH-MAZING! I just might have to try it out this weekend. Yumtastic.